Developing youth leaders for the global stage | WE can make it happen. 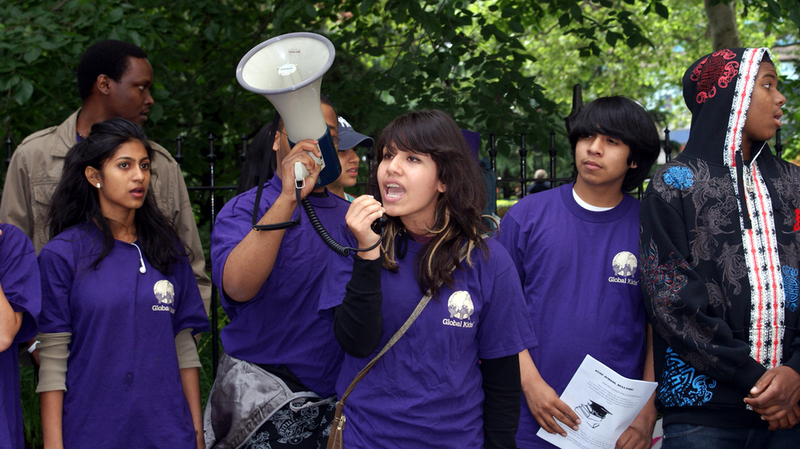 Global Kids, Inc. – the premier non-profit educational organization for global learning and youth development – works to ensure that urban youth have the knowledge, skills, experiences and values they need to succeed in school, participate effectively in the democratic process, and achieve leadership in their communities and on the global stage. Global Kids (GK) is committed to transforming urban youth into successful students as well as global and community leaders. Using interactive and experiential methods to educate youth about critical international and foreign policy issues, GK provides students with opportunities for civic and global engagement. For over 20 years, Global Kids has infused its programs with international affairs content and methodology to develop key 21st century skills in high school age youth including, literacy, problem-solving, and critical thinking skills. Youth develop a greater understanding of human rights, international relations, and the role of civil society in shaping domestic and foreign policy. To learn more, visit www.globalkids.org. Global Kids (GK) currently operates Youth Foreign Policy Summer Institutes in New York City and Washington, DC. Our goal is to replicate GK’s award-winning program model in the greater Little Rock area in the summer of 2019. The GK-AR program will consist of a four-week international affairs and leadership development program. During the first two weeks, participants will explore key concepts in public policy and foreign affairs as well as international career opportunities. In the second half of the program, students will travel abroad for a service-learning trip to Haiti, Costa Rica, or the Dominican Republic. Upon returning to the U.S., each student will design and implement a peer education workshop and service project that educates and inspires their classmates to become active on issues affecting their own community and communities abroad. Additional details about the program structure may be found here. Global Kids is now seeking support from schools, local businesses, like-minded organizations, and community members in the Little Rock area in order to make this vision a reality. If you would like to learn more about partnership opportunities, please visit our GK Partners page. If you would like to make a donation to support the program, please visit our Donation page. Photo credit brianchildvn. This photo was modified to fit the needs of Global Kids Arkansas.